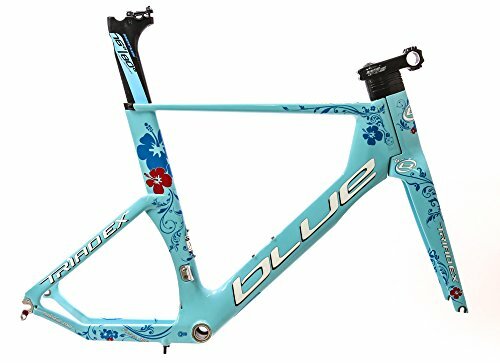 BLUE COMPETITION CYCLES TRIAD EX WOMEN'S TRIATHLON / TIME TRIAL BIKE FRAME NEW / SHIPS IN 24HRS / MADE IN TAIWAN SPECIFICATIONS: Brand: Blue Model: Triad EX Women's Force Weight: 3050 grams ( size 55.5cm - of frame, seatpost, stem, fork, headset, seatpost clamp) Condition: New take offs from new in box, partially assembled bikes. Cable routing: Internal Includes: Frame, headset, stem, seatpost, seatpost clamp, and BB30 bottom bracket Images and weight taken from size 55.5cm version. COMPONENTS: Frameset: BLUE-TEC High Modulus UD T-700 Carbon Fiber Seatpost: Aerus Carbon 76 / 80 Dual Position Stem: Aerus Tri-S Carbon Aero Bottom Bracket: FSA BB30 COMPATIBILITY: Front derailleur: Braze on, bottom pull Handle bar: 31.8mm Crank: BB30 only Front brake: Tradition center mounted side pull caliper Rear brake: Direct mount Wheelset: 700c Front hub: QR (9mm) x 100mm Rear hub: QR (10mm) x 130mm DIMENSIONS: PLEASE NOTE: The title of the ad defines this bike by the effective top tube length, measurement "A" shown in the image. That is what we chose to define the bike as. It's important to understand that there really aren't any standard ways a bike is defined in regards to size. It may be difficult for a novice who doesn't understand the complexity of non-standards in given measurements the bike world. A size "59" frame for example could mean many things. We strongly advise anyone steer clear of relying upon subjective measurements, such as "Extra Small," or using the number size of the bike and assuming it can only mean one thing. The best way to know a size is by comparison of a few objective measurements shown below; to what you had previously, alterations what you want now, etc. Proper and accurate size fit requires actual measurements.